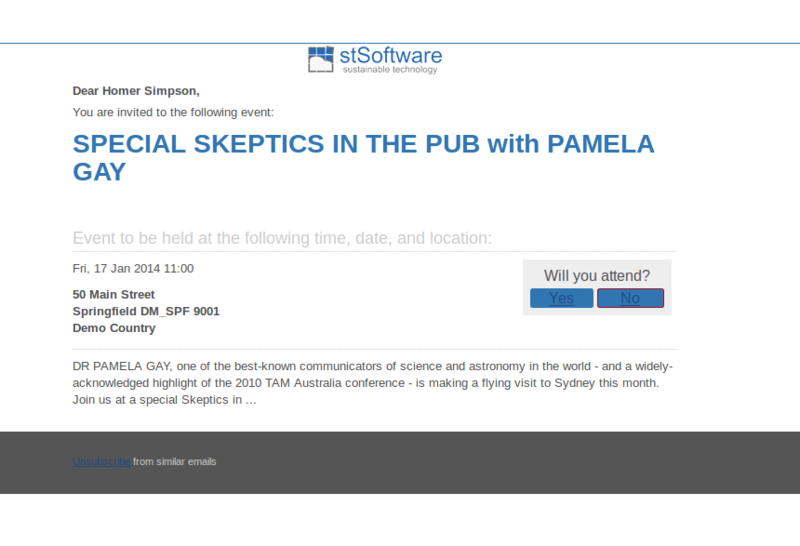 How do I send out event invitations? What is the new Calendar? 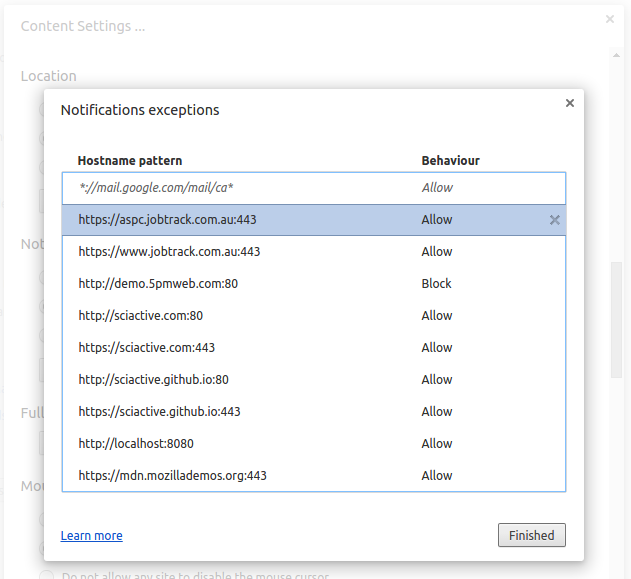 How do you change the welcome page? 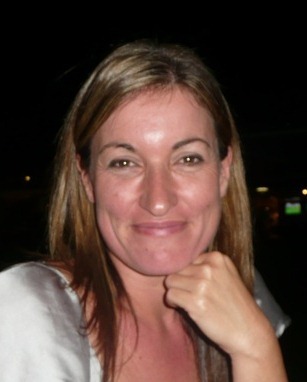 How can stSoftware&apos;s CMS be used to manage events and resources? 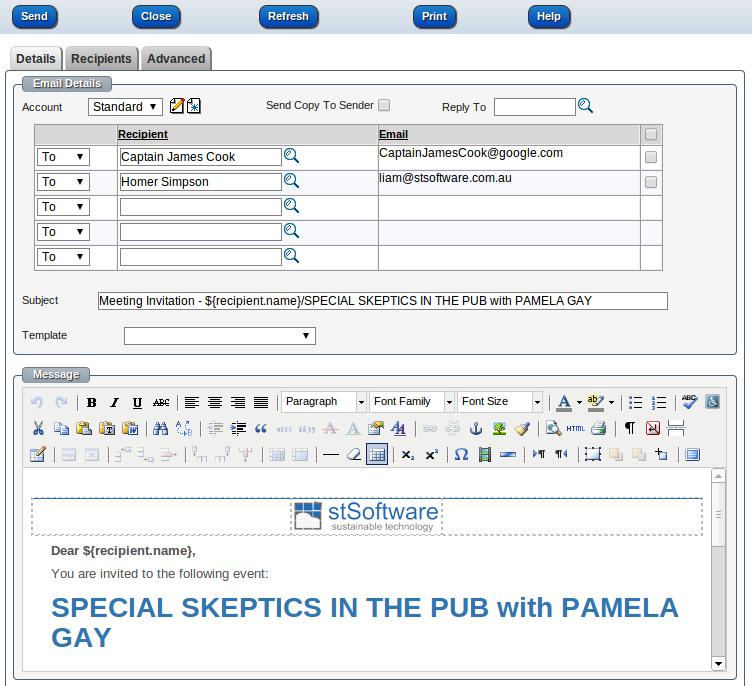 Press the button "Send Invitation" to create an email populated with your contacts. 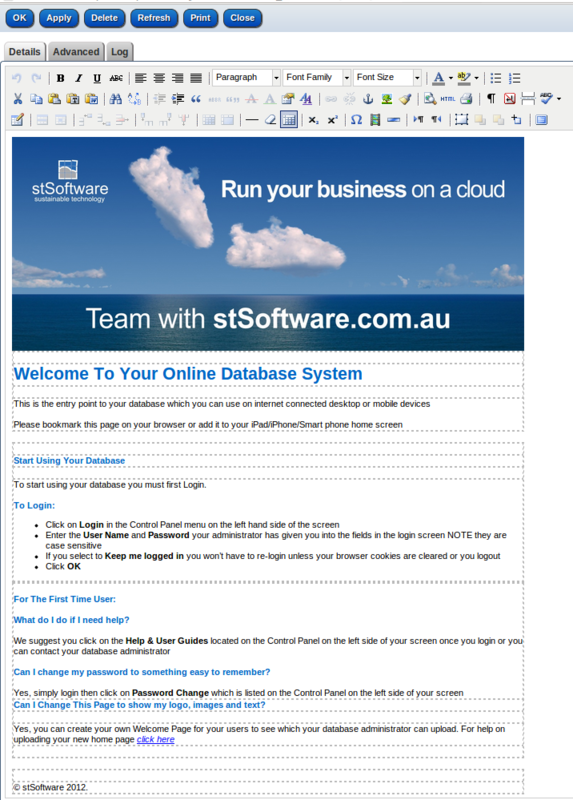 The email opens up with a pre defined template that can be changed. Your contact will receive an email that contains the options to accept your invitation or reject it. 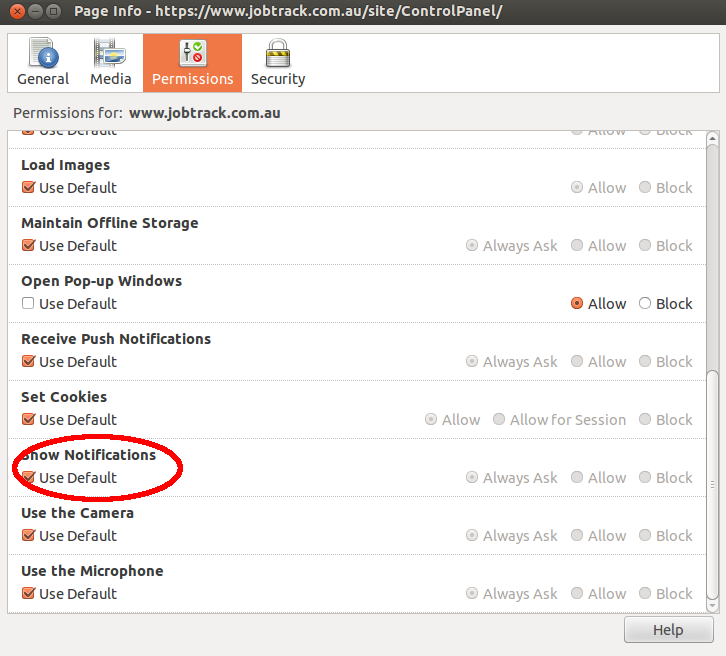 When the recipient presses "accept" or "reject" links on your invitation, the system will update the the attendee confirmation status. 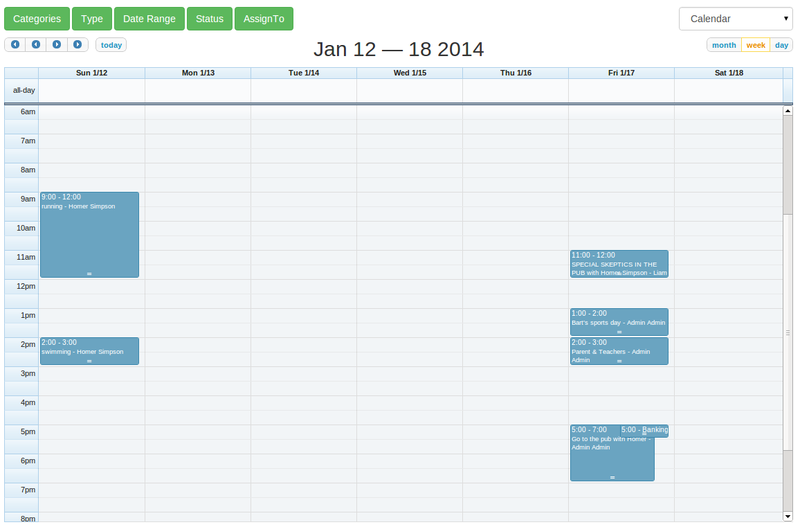 The new Calendar is a full-sized, drag & drop calendar. 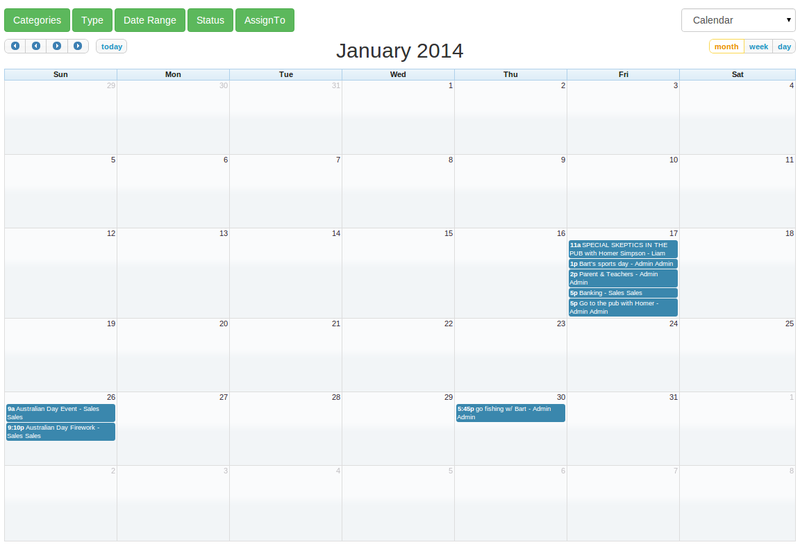 It uses AJAX to fetch events on-the-fly for each month/week/day. 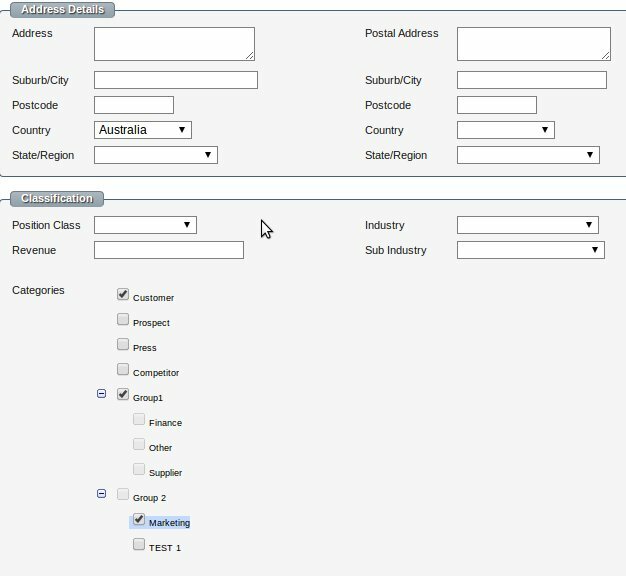 Select from the filters to change the date range and items displayed according to type, category, status and assign to. Items are tasks, events, sales opportunities or jobs which have been entered and scheduled to a day and time. You'll see items in the calendar. Click on the item to see the details of the item. You can switch between the calendar and timeline view any time. We've listed some handy Calendar Tips at the end of this post so read to the end! Drag & drop or resize! You can drag & drop an item to change its start time, or drag to resize and change it's duration when you're in the week/day view. There are 3 views: month, week and day. You can quickly jump to previews or next year/month using the arrows and click on the Today button to jump back to today. 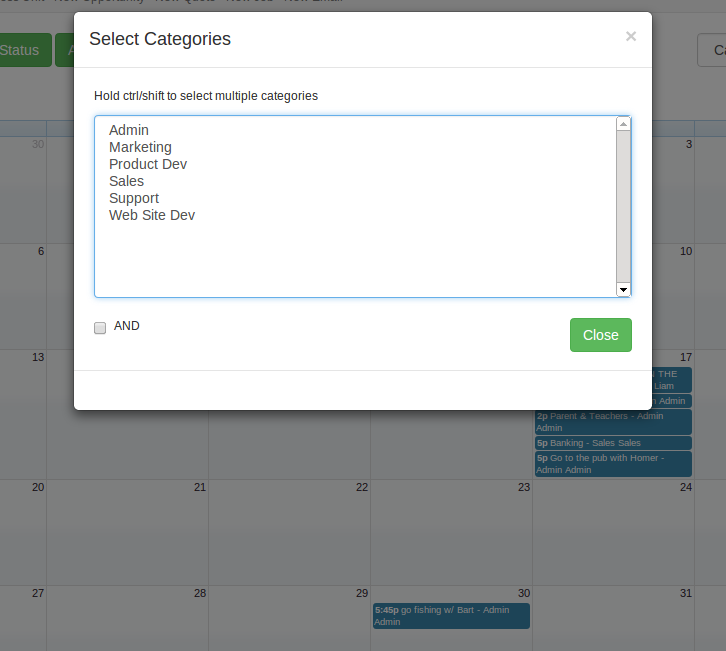 Select multiple Categories to filter your events, tasks, sales opps or jobs. 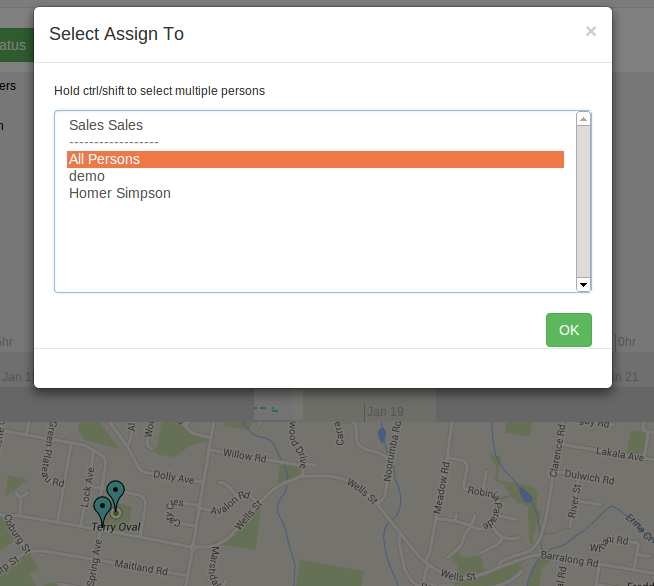 Select multiple Types to show events, tasks, sales opps or jobs. 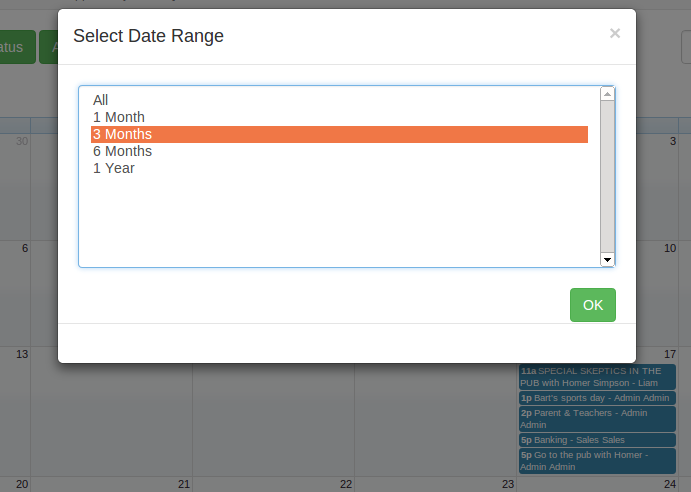 Select one of the Date Ranges to display that range of dates in the Calendar. 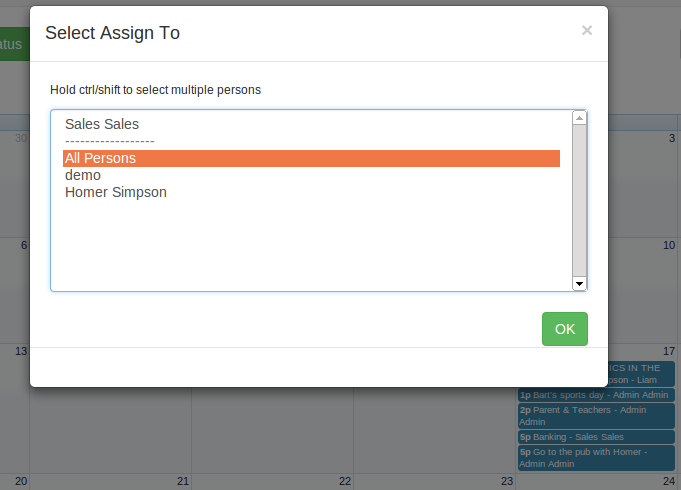 Select to show items assigned to one or more persons. 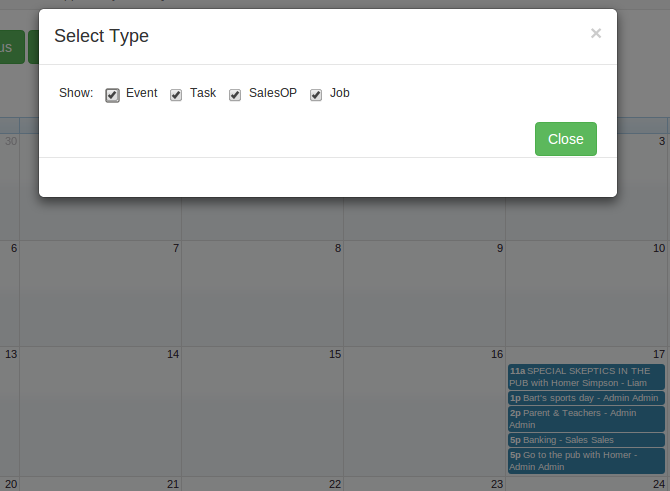 Some events, tasks, jobs or sales opps doesn't have a start time, these items are shown below the calendar. You can change the Welcome page in your application to keep your corporate look and feel and branding. 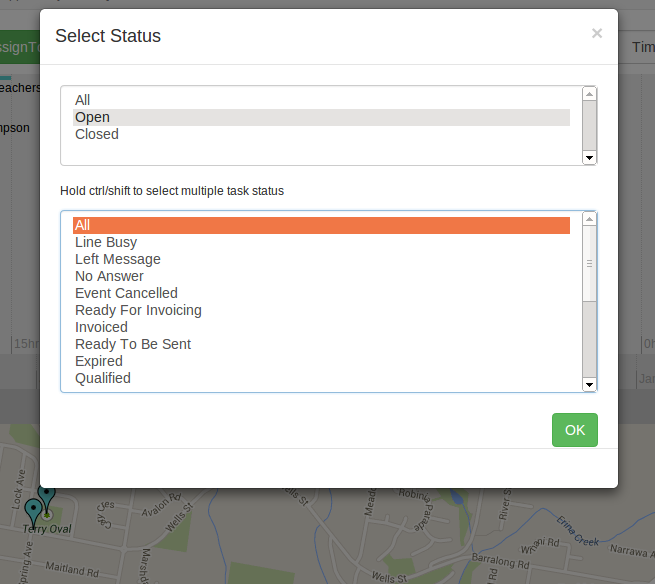 Keyword search on reports means it is easy to search for a word across multiple fields. A class can have many fields included in the key word search from the current record or related records. Keyword searches give a powerful search facility in a single "Google" style search box. 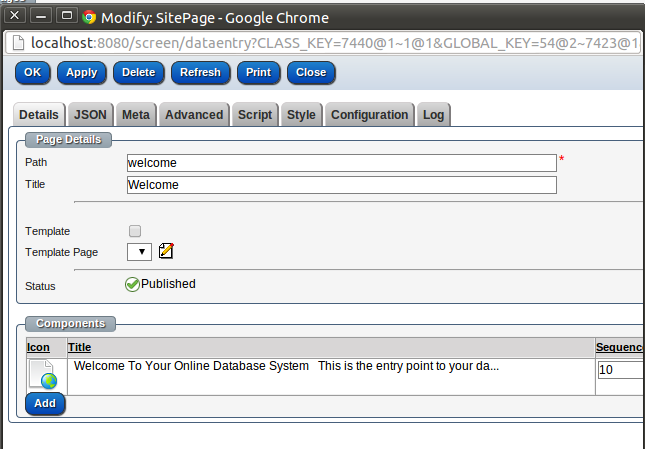 A convenient and simple search box can be used instead of the more advanced search screen in many cases. The keyword index uses the Soundex algorithm to create the unique set of words, this allows for direct index searches on either the actual words or the words that sound like those entered. Use quotes to search for an exact set of words. Only use this if you're looking for an exact phrase, otherwise you'll exclude many helpful results by mistake. Add a dash (-) before a word or site to exclude all results that include that word. This is especially useful for words with multiple meanings, like Jaguar the car brand and jaguar the animal. Add an asterisk within a search as a place holder for any unknown or wild card terms. Use with quotation marks to find variations of that exact phrase or to remember words in the middle of a phrase. 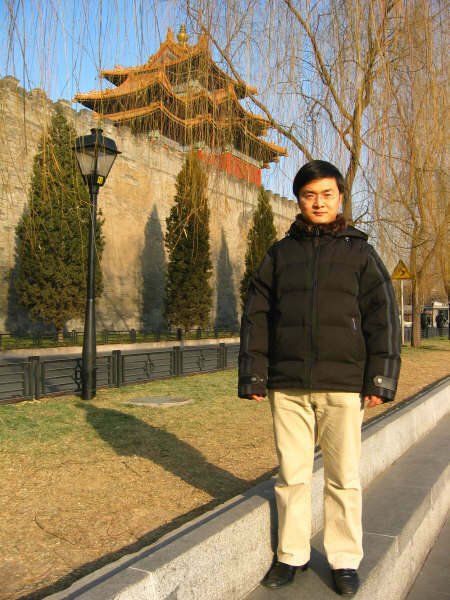 Will return any record that begins with the keyword and it is not case sensitive, for example fun will match; "function" "fun" "Fun" "having fun" "That is funny". fun would not match "malfunction" "notfun"
You will find the Keyword Search fields at the top of the report screen. Enter a keyword and click the search icon (magnifying glass) or press enter, the search result will show all the records with matching values in any of the listed fields. 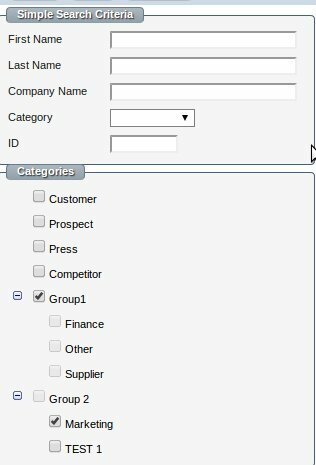 In the example below, by selecting the parent category called 'Group 1' , all the sub categories 'Finance,Other,Supplier' are selected automatically. 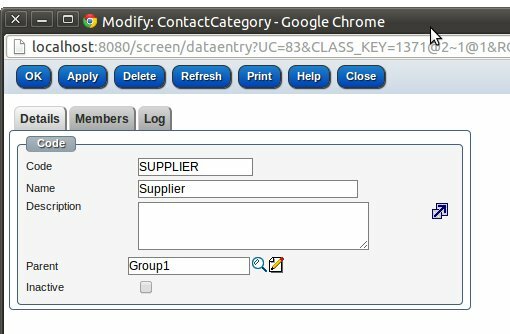 Go to Admin and open the 'pick list manger' and select the table called 'Contact Category', this table holds the list of categories. Create new category like 'Group 1', this category will be the parent group. 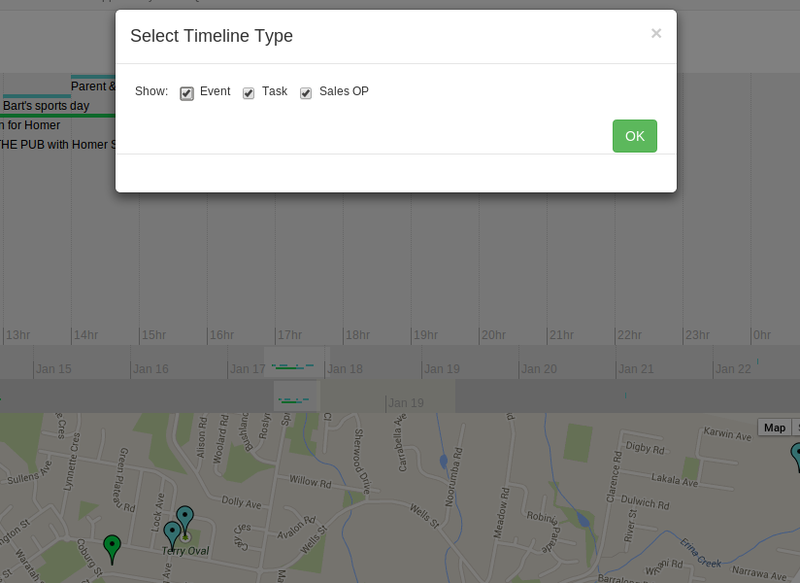 The Timeline module is a clever combination of sliding graphs and map to visualise your events, tasks or sales opps. 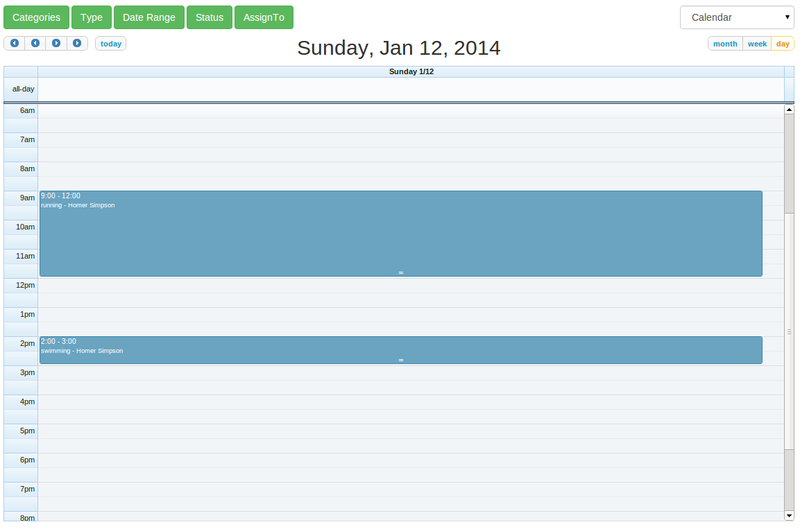 Select from the filters to change the date range and items displayed according to type, category and status. Items are tasks, events or sales opportunities which have been entered and scheduled to a day and time. You'll see items in timeline bands with a colour line representing their scheduled time and duration. The items you can view on the timeline bands are displayed on the Google map by markers. Click on the item in the timeline band to see a summary above the marker which is also a link to the item. Click on the item summary link to open the item. You can also click on any marker on the map to see the item summary. 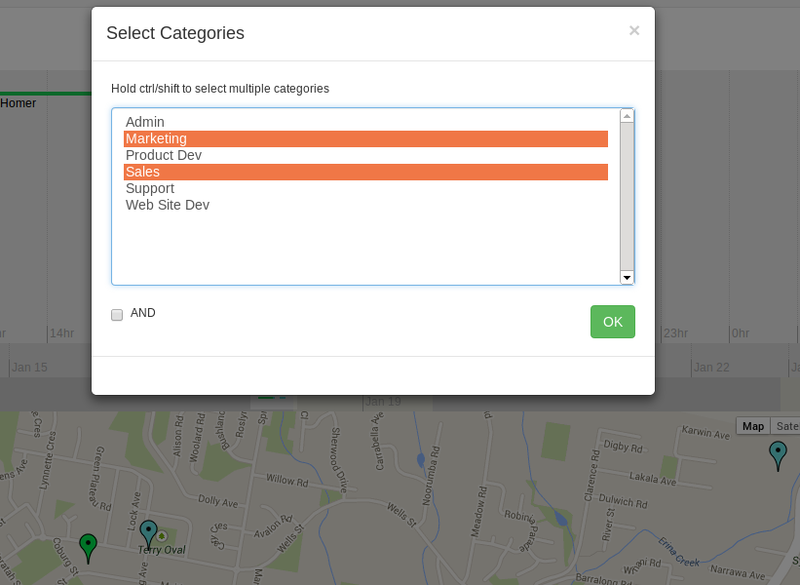 Select multiple Categories to filter your events, tasks, sales opportunities or jobs. 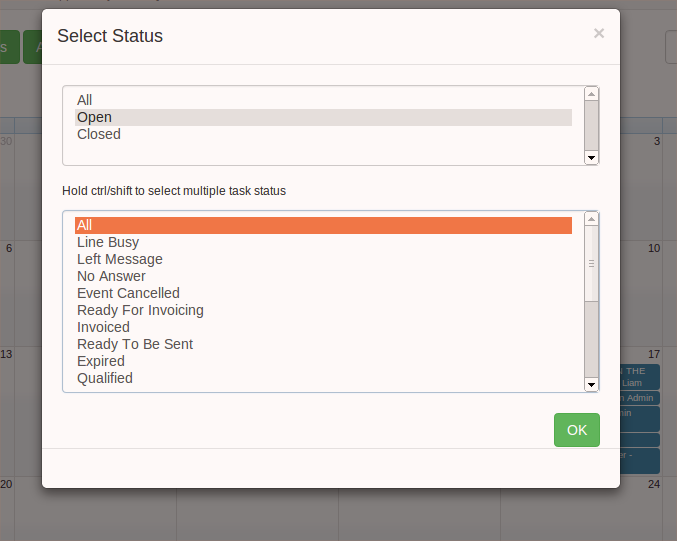 Select multiple Types to show events, tasks, sales opportunities or jobs. 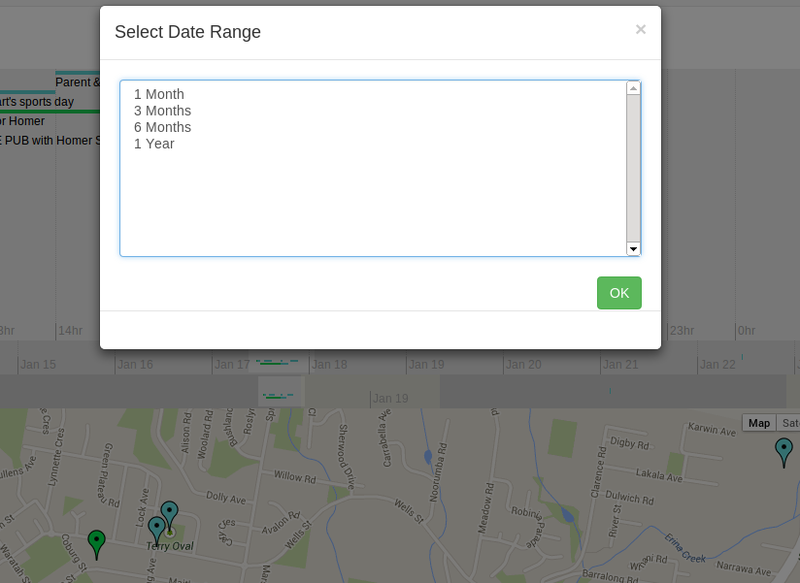 Select one of the Date Ranges to display that range of dates in the Timeline.